Effect of IL-13 on MAPK activation. 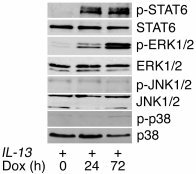 Western blots for phosphorylated (p) STAT6, ERK1/2, JNK1/2, and p38 were performed on lung lysates from CC10–rtTA–IL-13 mice (IL-13+) fed dox water for 0 to 3 days. Antibodies against the relevant total protein were used to control for loading. Data are representative of n = 4 for each group.